After 50 wins, two draws and just one defeat, Saul 'Canelo' Alvarez will look to add to his legacy by claiming the WBA super middleweight title on Saturday. Canelo has enjoyed great success at middleweight but now faces a real challenge as he steps up to take on 'regular' belt-holder Rocky Fielding in New York. The Mexican acknowledged earlier this year that he was taking a risk, yet he has risen to the occasion consistently throughout his career so far. 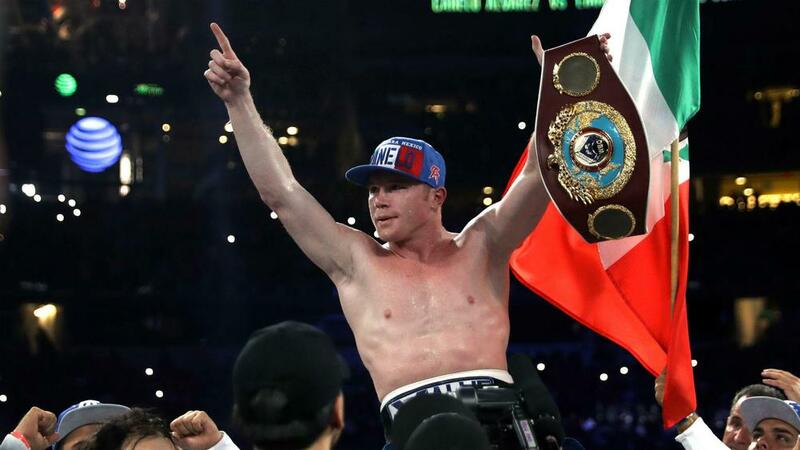 Ahead of his latest blockbuster bout, we take a look at Canelo's finest moments inside the ring. Just over two years after claiming the WBC's vacant light middleweight title against Matthew Hatton, Canelo added the WBA belt as he saw off Austin Trout. The American lost his unbeaten record in the unification bout as a raucous Alamodome crowd in San Antonio saw Canelo put Trout on the canvas for the first time in his career with a counter right in the seventh. All three officials went with the Mexican in a momentous points win. James Kirkland had been dubbed a 'mini Mike Tyson' before he came face to face with Canelo. Erislandy Lara had worked Alvarez hard in his prior fight some 10 months earlier, but the Mexican was back in top form at Minute Maid Park, Houston. Kirkland was first knocked down with a right in the opening round and lasted only until the third before another spectacular blow sent him crashing over and stopped the fight early. After taking out Kirkland, Miguel Cotto and the WBC middleweight title were next on Canelo's list. The judges' scores - 117-111, 118-110 and 119-109 - had Alvarez the clear winner as he claimed the belt from the in-form Puerto Rican, landing a big win for Mexico after a complete performance in which Cotto was out-thought and out-fought. A huge fight for Mexico saw compatriots Canelo and Julio Cesar Chavez Jr do battle on the 2017 Cinco de Mayo weekend. Victory secured the bragging rights for Canelo and it never looked in doubt, his opponent schooled and scarcely landing a punch as all three judges called the fight 120-108 in a simple points decision. This was a victory long in the making. Canelo and Gennady Golovkin had battled to an entertaining draw a year earlier, before a rematch was put on hold as Alvarez served a six-month ban for failing a drugs test. Despite many observers judging it differently, Canelo was awarded a majority decision after 12 rounds.